I recently started doing Judo. It was my seven-year-old son who got me started. When I saw that our local YMCA had a Judo club, I signed my son up for the class. “You should try it too Dad” my son would say every week. “It looks like fun” I’d say, “but I’m too old. My body can’t take that abuse”. After watching and listening to him for a few months, I finally gave in and went to my first class. By the end, I was hooked. Believe it or not, I found the feeling of tossing another human being through the air very satisfying. Unfortunately, my first month didn’t go so well. I broke my big toe in a practice match and had to have surgery. I wore a funny shoe for a month and couldn’t drive. I’m lucky that I work out of the house so getting to work wasn’t a problem. I couldn’t wait to get the all clear from my doctor. Now, a year later (and a year older) I’m finally back on the mat. The word Judo is Japanese for “gentle way” though if you’ve ever seen a Judo match, there’s nothing gentle about it. It’s a tough and physical sport. Jigoro Kano, the founder of Judo, is known for the saying “Maximum efficiency with minimum effort”. Judo is not about fighting strength with strength but using your opponent’s momentum to unbalance and throw him or her to the ground. If your opponent pushes, you pull – if your opponent pulls, you push. When done well, a Judo throw is a thing of beauty. Occasionally, while I’m practicing my throws (and watching out for my toes), I think about that notion of maximum efficiency with minimum effort. I’m learning more and more about what this means in Judo. But how do I achieve this as an architect? Sure, I’m using software rather than hand-drafting but given the sophisticated tools we have at our disposal, how can I truly maximize my efficiency while minimizing my effort? Architects are notorious for being perfectionists and for working long hours. And yes, there have been times when I’ve used brute force to overcome a deadline. “I don’t have time to figure out a better way” I’d say to myself, “I just need to get this done”. I just put my head down, put my headphones on and got to work. Sound familiar? This method certainly works but it isn’t sustainable over the long run. It’s using maximum effort with minimum efficiency. As architects, we need to be both effective and efficient in our work. We need to do the right things in the right manner. We need to determine the right things for our project, for our practice. We need to look at our working methods objectively and remove the friction wherever we find it. Technology is certainly a key part of this but it’s not the sole answer. Although strength is a key part of every Judo throw, brute force alone won’t toss your opponent through the air. In all likelihood, if you use only your strength you’ll wind up flat on your back. Yes, every project is unique but aren’t there aspects of our work that can be standardized? Can’t we develop more efficient ways to work? How can we use the pushes and pulls of our projects to our advantage and achieve this ideal of maximum efficiency with minimum effort? 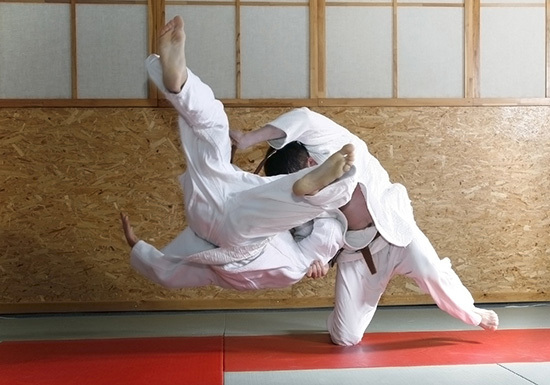 Can we develop a working process that’s as beautiful and as devastatingly effective as that well-executed judo throw? Thanks for the post! Do you have an update where you figure out any “Judo moves for architects”?